What are your passing triggers? 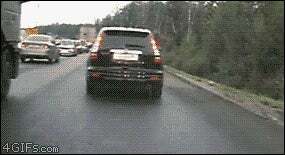 Not really the sort of passing I’m talking about, but this gif makes me happy. That is, what behavior on the part of other drivers makes you feel compelled to pass them on a two-lane road? I was behind a car today that was doing 40 in a 50 MPH zone. It was obnoxious, and if it were me, I’d at least pull on the shoulder, but it didn’t really bother me. I was content to just set cruise control and wait for a passing area. Or I would have been content to do this, but despite the fact that they were going 10 MPH below the posted limit, they also braked on every. single. curve. No matter how gentle and sloping. From the first time it happened to the first passing line, I had only a solitary concern in my entire life, and that was to not be behind that person. I had to struggle to resist the little voice in my head that was telling me to just pass on the double lines. (And of course, when I got to a passing area and went to pass, fuckweed actually sped up, but they were in a late model Continental, so I didn’t even have to put the pedal down far to put accelerate, but I still did, just so I could hear my Jag’s normally silent engine get angry). This was an obviously obnoxious case, but something about braking on turns just triggers me. Even if someone is otherwise going over the limit, even if they just tap their brakes and don’t even shave off speed, I just have this absolutely compulsive need to pass anyone whose brake lights come on on a curve.